the King-Frazier Ballroom on last Thursday, April 2, 2015. Williams, Program Director and WSSU Tiger’s Roar TV. additional awards all chosen by the students of SSU/JMC. benefits from their studies at SSU. 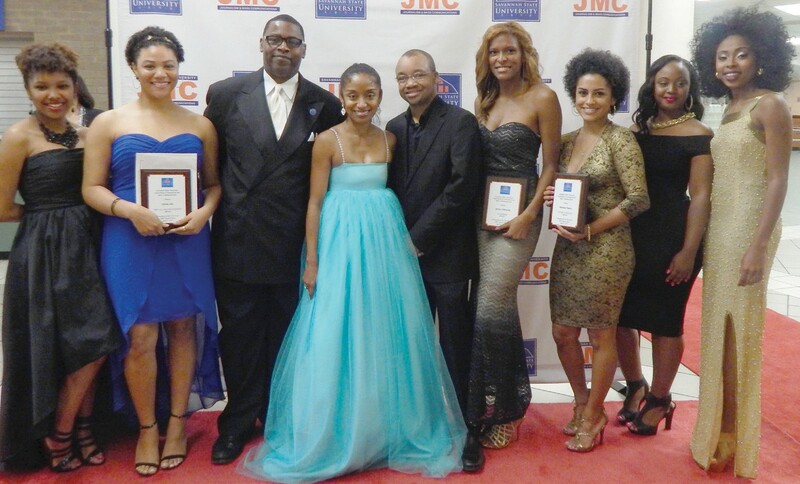 presented awards including: The Highest GPA award to Richard Walls, the Future Journalist award to Diorlena Natera, the Best Photographer award to My’ron West, Future Author to Kandace Reynolds, the Future Publicist Award to Jasmine Miller, Best Web Design to Kristie Ferrell, Best Real World Experience award to Jasmine Miller, Best All Around Student to Sylvia Alls, and Chair’s Award to Jahylin McKee, Travis Nixon, and Richard Walls. These awards were chosen by the JMC faculty. marched into the room and got the crowd to their feet. and how she pushes them to be resume builders.